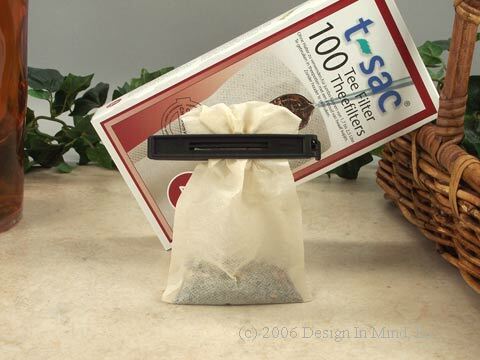 T-sac tea filters are single use unbleached paper filters for loose tea. T-sac tea filters have a gusset bottom and long extension flap that makes them the best do it yourself teabag on the market! 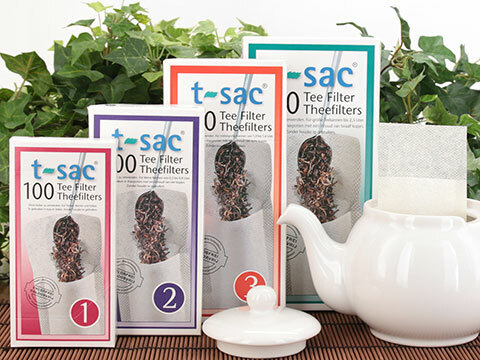 T-sac tea filters are available in 4 sizes, are easy to fill, and clean up is easy! Used t-sac's make great compost! 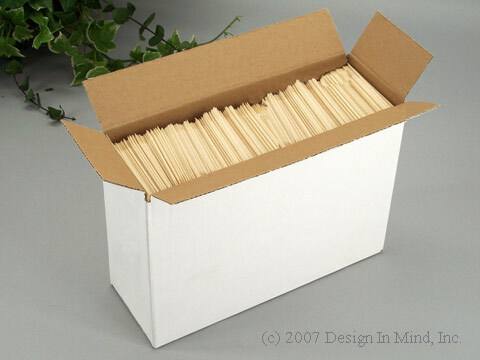 Retail boxes contain 100 filters. Sizes 2 and 3 are also available in a 1000 count service pack! Made in Germany except as noted. size 1 - 2.5 in. W x 3.5 in. (pouch), 4.7 in. with flap. Single serve, 6 - 10 oz. Use size 2 for bulky green/white teas. size 2 - 2.9 in. W x 4.1 in. (pouch), 6.2 in. with flap. 2 - 3 servings, 10 - 18 oz. Recommended for food service. size 3 - 3.3 in. W x 5.4 in. (pouch), 7.2 in. with flap. 4 - 6 servings, 24 - 40 oz. size 4 - 4 in. W x 6 in. (pouch), 7.9 in. with flap. 4 - 6 or more servings, 40 or more oz. T-sac tea filters are single use unbleached paper filters for loose tea, with a gusset bottom and long extension flap that makes them the best do it yourself teabag on the market! Available in 4 sizes, easy to fill, and easy clean up! Single boxes. Save on Shipping! Up to seven boxes,quantity decreases with size, ship First Class Mail. Disposable unbleached paper filter bags for use with loose tea. These easy to fill bags have a longer flap on one side to help close the bag or trap the top of the bag under the teapot lid. For herbal teas, use one size larger than recommended below. 12 boxes of 100 per split case. Disposable unbleached paper filter bags for use with loose tea. These easy to fill bags have a longer flap on one side to help close the bag or trap the top of the bag under the teapot lid. For herbal teas, use one size larger than recommended below. 48 boxes of 100 per full case. Disposable unbleached paper filter bags for use with loose tea. Available in two sizes. These easy to fill bags have a longer flap on one side to help close the bag or trap the top of the bag under the teapot lid. 1000 per carton. TIP: Suggested quantities are chosen to minimize packing materials in the shipment. TEA CLICK - Stainless Steel Tea Filter Clip. The finum Tea Click is a quick and easy way to close tea filters. To open, use both thumbs, press the click until open. Insert your tea filled filter into the click and press to close. Place your filter in your teapot, or mug, hanging the click on the side. Recommended for sizes 1 and 2 t-sac only. Use the CLIP for sizes 3 or 4. Molded plastic clip for use with the t-sac. The Clip is 4 inches long. It will close any size t-sac. 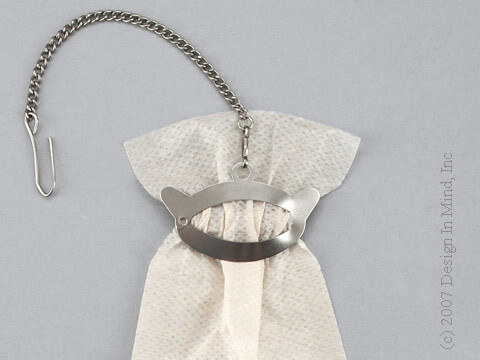 Recommended for suspending small t-sacs in a mug and for closing large t-sacs when making large amounts of tea or cold infusion iced tea (see "Cold Brew Iced Tea" in the Main Menu () under Information.) The clip is food and dishwasher safe. Made in Sweden.